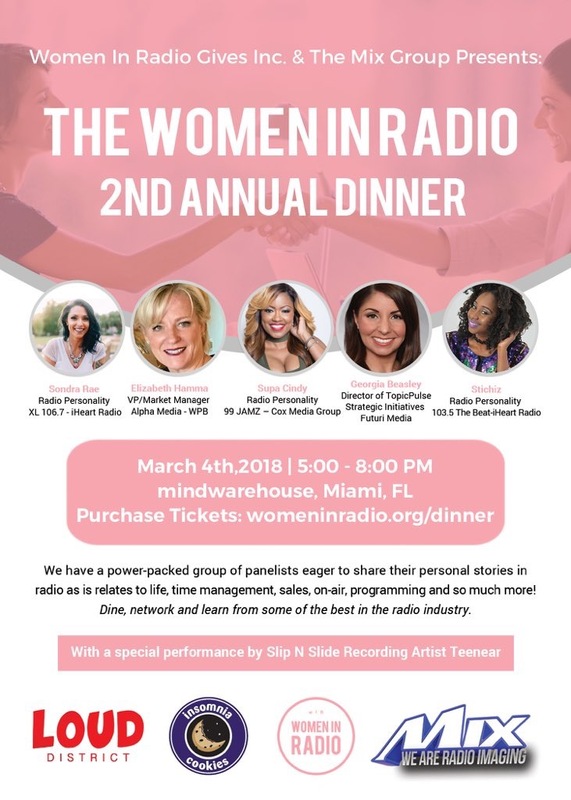 The 2nd Annual Women In Radio Dinner is March 4th,2018 in Miami,Fl at Mind Warehouse from 5-8PM. We have a power-packed group of panelists eager to share their personal stories in radio as is relates to life, time management, sales, on-air, programming and so much more! Come dine with women from the radio industry, listen, network and learn. Our panelists include, Supa Cindy (99 JAMZ), Georgia Beasley (Futuri Media), Sondra Rae (XL 106.7), Elizabeth Hamma (Senior Vice President/Market Manager of Alpha Media WPB) Stichiz (103.5 The Beat). Plus, enjoy an intimate performance from Slip N Slide’s artist, Teenear! Be sure to get your tickets while you can, there is only a limited supply! This event is made possible by, Women In Radio Gives Inc, The Mix Group, and L.O.U.D District.